I took a "colectivo" from Tulum and in a short time I was walking on the small street than would lead me from the main road to the beach of Akumal Bay. On this street you will find 2 or 3 fake tourist information centers which are actually tourist agencies, they will try to sell you or rent something: bikes, snorkeling gears, tours.... just say you don't need anything. When I finally got to the beach I was approached by a representative from SEMARNAT (the official organization for the protection of the environment) that explained to me all the important rules that everyone should follow to protect the animals and the reef: it is forbidden to touch and feed the animals or to go too close to them, you can't use lotions and if you want to swim in the protected area you need to wear a snorkeling jacket in order to protect the reef (you can rent one if you don't have it). SEMARNAT also have authorized guides that offer snorkeling tours, they offered me one for 500 pesos (25 euros) but I have to admit that it is quite difficult for me to give you a price because it seems to change a lot according to the number of people, their origin, and on how good you are at negotiating (and I'm quite bad at it). If you are not on a tour and you are not wearing a jacket you are not supposed to enter the protected area, especially in the busiest hours of the day, but I have to say that I didn't really need neither of them, all I needed was a bit a patience (as you will see). 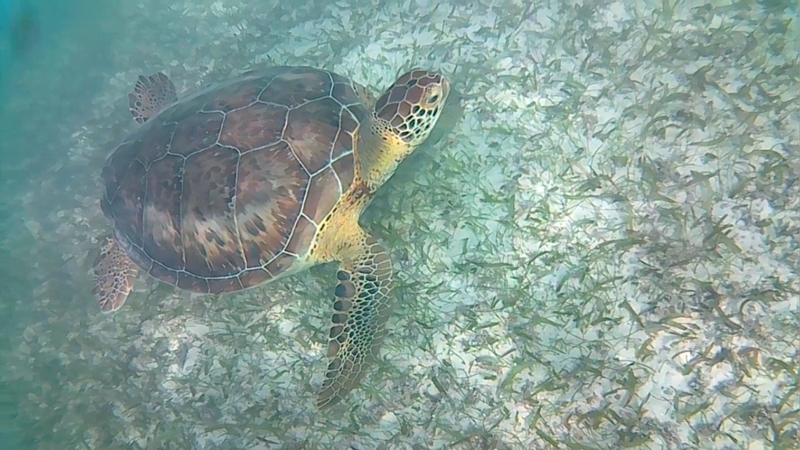 So, after the walk and the tutoring I finally entered Akumal Beach....and, oh my God, this is what I found! The beach was totally crowdy. Both locals and tourists were listening to loud music, eating, drinking and smoking. All the bars and the restaurants were full of people eating nothing but meat and fish (and that is quite annoying for me). I soon abandoned the idea of a swim because the water was overcrowded too. 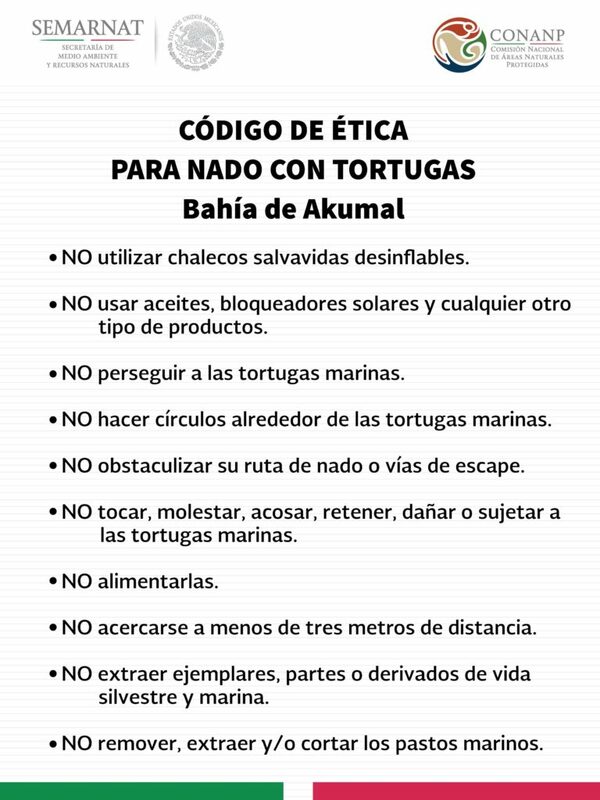 I soon learned that even if the bay was declared a protected area, commercial businesses are still the main interest for everyone, as I wrote in another post titled Akumal beach: a protected area? Lucky enough I feared this could happen, so I had a plan B: looking for a quite spot and waiting until most people would start leaving. 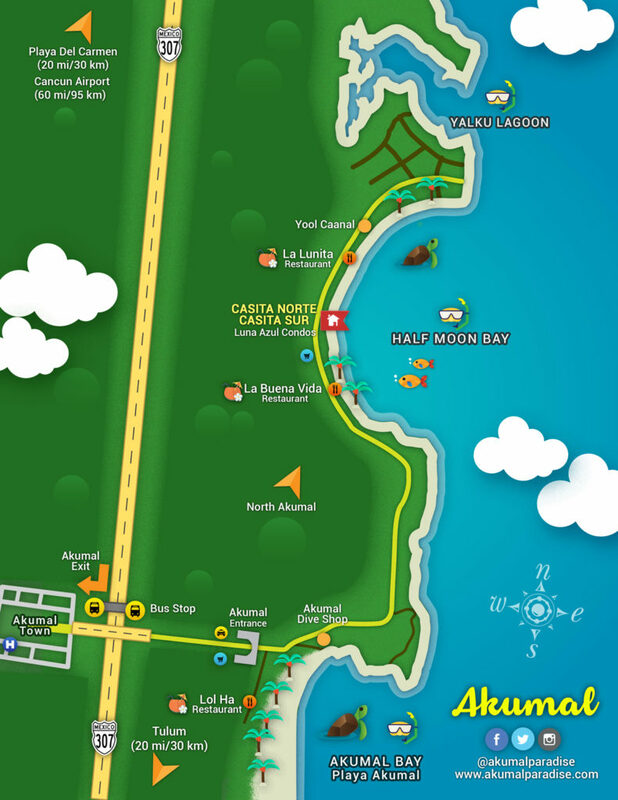 My plan B is called Half Moon Bay and it's a small beach right next to Akumal, easily reachable on foot (just follow the small street leading north). If you are looking for white sand, silence and peace...this is the place for you! Half Moon Bay is a small beach surrounded by private houses, apartments and villas, there are only a couple of restaurants but nothing compared to Akumal Bay. At a first glance one could have the impression that this is a private beach, but actually there is no such thing in this area: you won't find a public street leading from the road to the sand, but you can just take one of the paths in between the buildings. 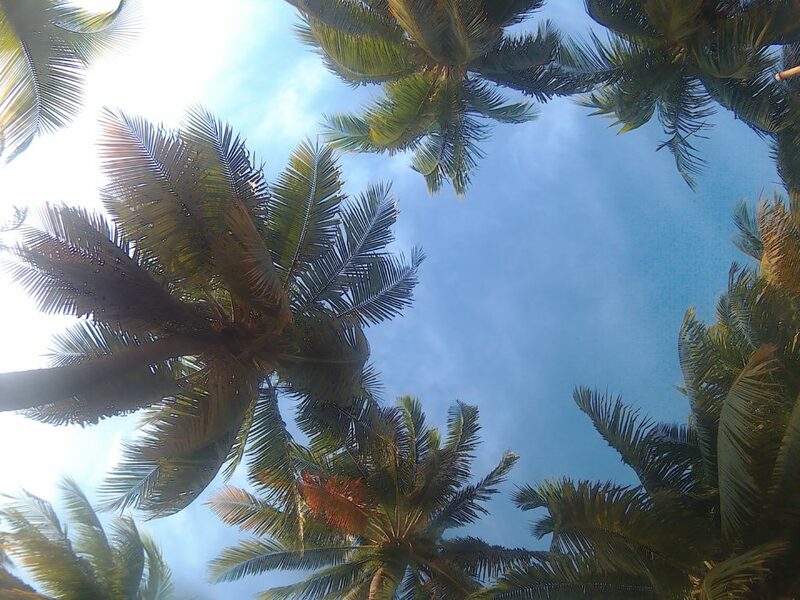 Once you are on the beach...just pick your favorite palm-tree for shadow and relax! As far as turtles are concerned I have to admit that I didn't see any here, but I could do some nice snorkeling anyway, and had the opportunity to see a few nests. I enjoyed this beautiful place almost all day long, but around 6pm I decided it was time to go back to Akumal Bay and try seeing the turtles. 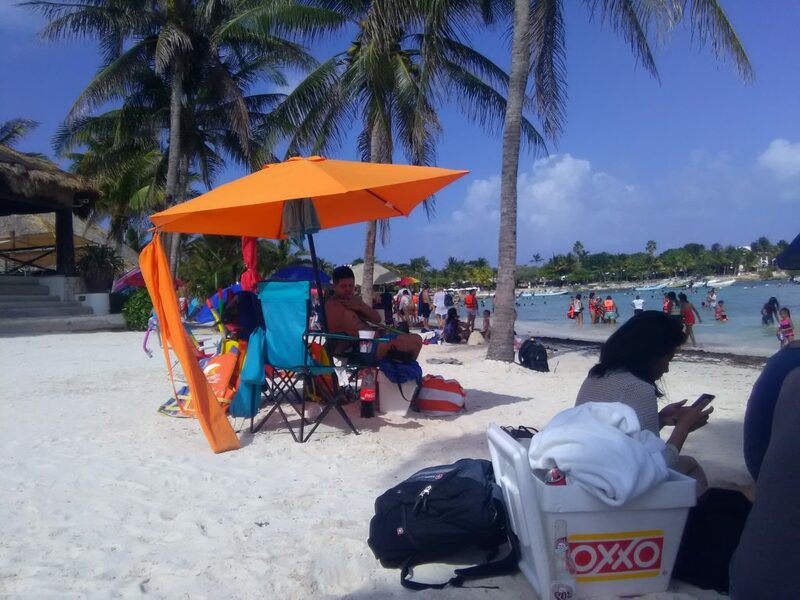 If you don't like partying on the beach and spend your day among hundreds of people, the best time to visit Akumal Beach is late in the afternoon. I came back at about 6.30 pm and as both the beach and the water were less crowdy I decided to have a swim and look for the turtles. At this time of the day there are less guards so you will be free to swim around without a jacket as long as you respect the animals, and that's why I didn't need a guided tour or the snorkeling vest. It may look silly but as I got into the water I saw some of the most beautiful things in my life: not only the turtles, gently eating sea-weed, but also barracudas, devil fishes and many other astonishing creatures. It is really unbelievable that the majority of people still think of them as food. As a matter of fact, when I got out of the water I saw a fisherman proudly exhibiting a barracuda he had just fished.... such a beautiful being killed just for food, what a shame. From TULUM: take a colectivo -white minivan- from the pueblo (there are designed stops) direction Playa del Carmen, from the road in front of the San Francisco Supermarket (opposite to the entrance) or in front of the ruins (same side of the street). If you are waiting on the road just raise you hand to ask for a stop. In summer 2017 the prices for a ride were between 25 and 35 pesos according to the company (there at least 3 companies the drives colectivos in that direction). The cheaper on at the time was the "Tiburones del Caribe", they have a RED stripe on the van. Ask the driver to stop you in Akumal beach, at the stop right under the bridge that will let you cross the street to go back. Just right there you will see the path that leeds to the beach, you can't miss it! From PLAYA DEL CARMEN: take a colectivo direction Tulum. Ask the driver to stop you in Akumal beach, at the stop right under the bridge; you'll have to cross the bridge and you'll find the path to the beach. The entrance to the beach is free, if you want to take a tour you may pay around 500 pesos, just be careful and choose an authorized one. The official organization for the protection of the environment is called SEMARNAT. Hi Larae just drop me an email at info@myvegantrips.cloud, thanks!